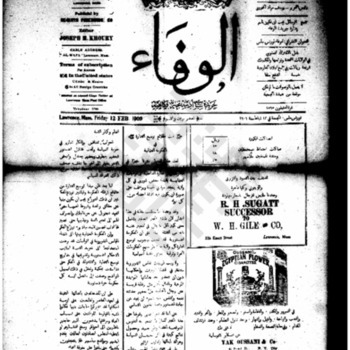 Date is exactly "February 1909"
An issue of Al-Wafa [الوفاء] newspaper dated February 2, 1909. An issue of Al-Wafa [الوفاء] newspaper dated February 5, 1909. An issue of Al-Wafa [الوفاء] newspaper dated February 9, 1909. An issue of Al-Wafa [الوفاء] newspaper dated February 12, 1909. An issue of Al-Wafa [الوفاء] newspaper dated February 16, 1909. An issue of Al-Wafa [الوفاء] newspaper dated February 19, 1909. An issue of Al-Wafa [الوفاء] newspaper dated February 23, 1909. An issue of Al-Wafa [الوفاء] newspaper dated February 26, 1909.